Want to choose the right Porsche Cayman or Boxster? Read this. A while back, we told you why we thought dropping an extra $11k on the GTS variants of the Boxster and Cayman is worth the eye-watering cost of entry—and we stand by that. It's a "good deal" in Porsche parlance. Remember, it's Porsche's world, and we're all just tacking on $23k in options on the average sale, right? But if the GTS isn't your cup of very expensive German tea, then you have options. Lots of them. The Cayster lineup is 6 models deep, and the options (real performance options) are legion. It could get ugly. But that's why we're here, and why we sent one of our own to do the hard work of driving all of them at Mazda Raceway Laguna Seca so you don't have to. See, we're looking out for you! We cut through all the clutter and let you know which options matter, which models are street- or track-suitable, and which packages are junk and should be avoided. 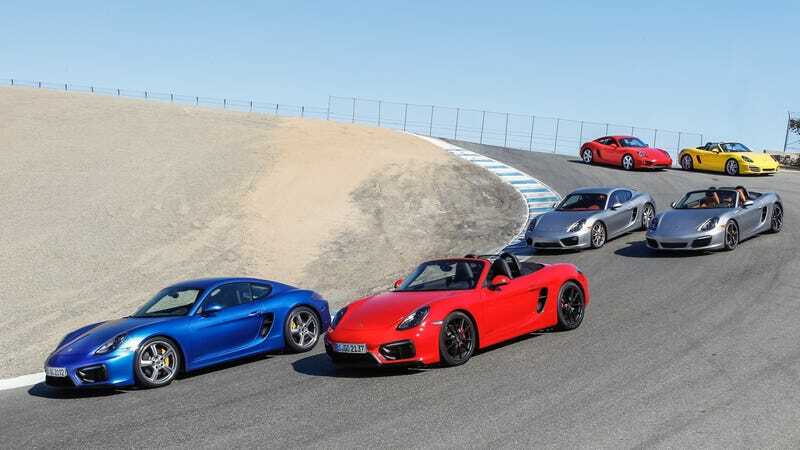 If you're considering buying a Cayman or Boxster and weren't invited to drive the entire model lineup at a racetrack, it's worth getting our thoughts on the matter. You know. For science.